What is the difference between electron geometry (electron domains / electron clouds / steric number) and molecular shape (molecular geometry)? Both are very similar, but the difference is in how we treat that electron’s lone pairs versus the bonds. In molecular shape (molecular geometry) you treat the electron’s lone pairs and the bonds as two different and separate things. However, with electron geometry (steric number) lone pairs and bonds are treated the same. You also treat double and triple bonds as one group instead of 3 just like you did in molecular shape. This means you count up the lone pairs and number of atoms attached to the central atom into one number (the steric number) and from there determine electron geometry. 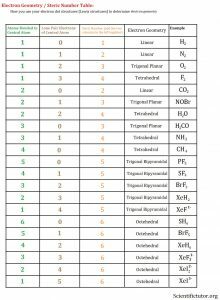 Refer to the electron geometry table below. 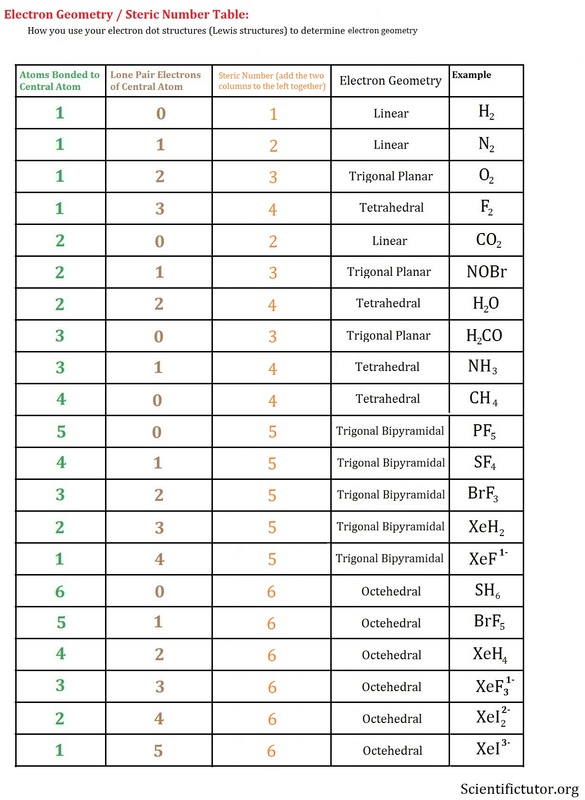 Examples: Use the electron geometry table to determine the steric number and electron geometry of each molecule. VIDEO Electron Geometry Examples 1. What is the steric number and electron geometry of SO2? What is the steric number and electron geometry of SH2? What is the steric number and electron geometry of BrF3? What is the steric number and electron geometry of PH5? PRACTICE PROBLEMS: Use the electron dot structure (Lewis structure) and the electron geometry table to determine the steric number and electron geometry. What is the steric number and electron geometry of NH3? What is the steric number and electron geometry of NO3-? What is the steric number and electron geometry of N2? What is the steric number and electron geometry of H2O? What is the steric number and electron geometry of PBr5? What is the steric number and electron geometry of BrH3?